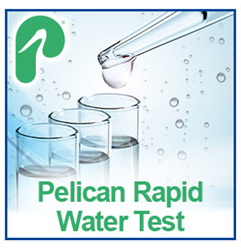 Pelican Water Systems, a leader in the water softening and filtration field, announces a new rapid water testing system. Using in-house labs, the company is able to screen for 12 contaminants frequently found in drinking water and offer results in just seven days. Today, there are so many water related issues restricting America’s water supply, from high levels of lead found in tap water to excess chlorine being used to control bacteria, it appears we’re headed towards a national water crisis. In response to growing consumer concerns, Pelican is excited to announce the launch of their in-home rapid water testing kit. The home testing kit, available now, arrives quickly via UPS shipment complete with sample bottles and clear, simple-to-follow instructions. It also comes with a prepaid UPS return label to send the sample back to Pelican for analysis. Within seven days, the customer has results emailed to them and the option to have a conversation with a Pelican Water expert about the most suitable water system for their needs. Pelican Water experts will manage the entire process. Pelican Water Systems launched the in-home test following increased consumer demand in the wake of the recent water contamination crisis in Flint, Michigan. Pelican Water System’s rapid water test offers a swift seven-day turnaround on submitted water samples, which is one of the quickest result times in the water industry. At $99, the Rapid Water test offers a profound value. As an added bonus, the cost of the 12-Point Pelican Rapid Water Test is free if the customer purchases a Pelican Water system. Pelican will offer $99 back towards purchase, the full cost of the water testing kit, should a customer go on to order a whole-house water filtration system following their water test results. Pelican Water Systems will continue to offer an extensive range of water testing options with the use of a nationally certified test facility. These tests can provide more extensive testing with more in-depth analysis of the water sample. PelicanWater.com is the official, factory-direct retail website for Pelican Water Systems, providing professional knowledge and leading technologies in whole house water filtration, countertop water filtration systems, UV bacteria disinfection systems, as well as salt-free water softening and conditioning systems. Pelican Water products use cutting-edge technology and enable customers to go green by eliminating wasteful and harmful salt brine discharge that is polluting our valuable fresh water resources. For over a decade, Pelican Water has stayed true to their mission statement: being a company that helps families enjoy cleaner, safer, better-tasting water in their homes in an environmentally-friendly way. Pelican Water has been and continues to be the global market leader in salt-free water softening system. For more information about Pelican Water Systems, visit PelicanWater.com.